"Market power is critical to the future of design firms. There is neither time nor the resources for design firms to know all they need to by themselves. Who do they look to? They look to Kerry Harding for support, thoughtful ideas, useful advice, and coaching...he offers a complete tool kit of ideas for professionals." Activity vs. Solutions: What Matters to Your Client? Today, the U.S. construction industry is a fractured industry that is a disjointed group of architects, builders, lenders, manufacturers, lawyers, government agencies, and owners �working in an unstructured environment. No standard process exists; a single building code doesn�t even exist. Every project has its own process invented and implemented for the circumstances. Process varies from location to location, from client to client, from building type to building type, all before private agendas and personalities further consume the overall dynamic. Smart, efficient process is essential to the health of the client/ architect relationship. Yet, generally speaking, the client is focused on progress and product, not process. Too often the architect or designer becomes obsessed with process to the point that it becomes damaging to the client/ architect relationship. Most clients with interests in developing the built environment (a product type or corporate facilities) recognize this unstructured environment and therefore seek control of its ramifications. To the client this translates as process management and control that generally manifests itself in the form of an internal staff of architects, engineers, and project managers. Over time, this �in house staff� develops standards and is relied upon to protect the interests and advance progress of the design and construction for the company. Frequently it is difficult for architectural firms in private practice to stop and comprehend that the primary objective/ business of their client is not design or construction but rather the use of facilities to steward their product or service mission. So too, it is difficult for architects and other design professionals to make the transition into a corporate staff and then recognize that they are a service which is secondary to the primary mission of the company. As architects, whether in private practice or working within a client�s domain, we often dwell on the process. We are trained as planners and designers and so we assume �the design of the process of design.� The end-game presumably results in some sort of efficiency for the client. With the advent of new technology and new materials, this process of designing the process will logically never end. However, the �in-house architect� and/or the private architect must recognize that the sophisticated client wants progress, not process! Great process is and should be invisible to the client. A well-known CEO once interrupted a well planned, lengthy presentation on brand imaging with the request, �Just show me the last board!� The message may seem rude, but in fact he was saying he trusted the designers to know their own process, and, the evolution of the brand, but his time was valuable, so give him the answer. The in-house architect and the private practice architect must stop and recognize the importance, yet invisibility, associated with process. Clients don�t want to hear about process other than in the form of guaranteed measurements of reduced time of cost. The client wants assurances and confidence that the architect knows what it takes to get a building permit, knows what it takes to meet all code issues and knows the latest CAD software, etc. Those private practice firms that ultimately deliver progress for the client will be the firms that grow their business and their profits while obtaining new clients and repeat business. The �in-house� architects that recognize this will ultimately add value for their shareholders. The architect must never underestimate the knowledge and skills of the in-house staff. Doing so will almost certainly undermine the client/ architect relationship. A knowledgeable client maintains market expertise through an architectural staff. The organization may act as an internal licensed architectural firm or simply as owner�s representative to outside firms or both, much like a publisher/writer relationship. The mission of the architect is to assist the client in sorting out the aforementioned unstructured design and construction environment. But behind the very creation and deployment of architectural positions within a client�s organization there may be subtleties not immediately recognized on the outside. Often the need for confidentiality is essential. Maintaining in-house control over design assists confidentiality. The level of complexity of the project, may dictate coordination with specialty departments. Coordination with these departments is also a factor that leads to progress on the project. As well, specialized talent may also be within a client�s domain and keeping that talent may be critical to the client�s mission. Finally, placement of liability can be a catalyst for the size and scope of the client�s organization as well as the capital to be invested. Accepting that most knowledgeable clients will maintain an �in-house� staff, what trends will affect the client/ architect relationship? Be assured that the client will continue to hire outside architects and designers for similar reasons that an internal staff is created. Talent, design, advice, control, confidentiality, and coordination will be key. Of course, the economy, the competition, and the long-range growth plan of the client will determine the volume of work.. However, the liability issue with outside architects is exaggerated. Why? Because with a large sophisticated client, with a staff of architects and designers, figuratively, the client�s fingerprints are all over the drawings and any subsequent litigation will seek the deeper pockets. The most visible trends are in the advancement of technological applications for visualization; production documents, communications, project collaboration networks, etc. We are all familiar with most of these applications. A new little used trend is project process simulation. The idea is to visualize project phases by integrating tasks and staffing with the organization and individual staff characteristics. Yes, individual abilities and experiences are utilized, and then random simulations are performed to predict project results. Hence, optimal staffing, coordination of key decision points and more accurate forecasting of hours and expenditures are possible. This is now being experimented with on specific software applications. Although the architect may save the client�s time and money with these tools�they are process tools�and in theory, therefore invisible. Most clients seek incremental progress status measurements. These may be different form the traditional design and production phases and deliverables. They may be required in the form of earned value assessments, sheet counts, hours per sheet, overhead analysis, etc. Learn the client�s progress measurement systems and fill in the blanks. Again progress is the key to client satisfaction. When an architect represents your client what is different about this theory? Nothing! 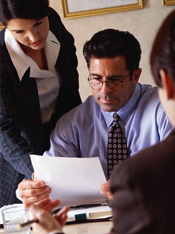 Except you have a corporate insider who can work with you as an interpreter of the client�s goals. The most successful firms understand this and adapt their process to the client�s goals. Often pride of authorship must be set aside to demonstrate flexibility and response to the clients overall program. This in turn creates repeat business and �favored� architect status, which once again helps the client achieve progress. Sometimes there is tension created between the architect and the client�s architectural representative. Causes of this tension range from lack of mutual respect to contractual disputes. But real fragmentation is often caused by lots of discussion and change in process and little progress. This doesn�t mean subservience is required to succeed. But rather true expertise and talent should be expected from the consulting architect/ designer by the owner�s architect/ designer. Too often great opportunities are missed by the inability to articulate a vision or ask the right question. Often assumptions are made based on past projects or corporate �mythology.� For example, another highly respected CEO was known to dislike any use of the color blue in interior spaces. Working with a defensive and protective corporate staff, an astute and very talented outside interior designer said, �I want to present several shades of blue within this restaurant and here�s the rationale.� Reluctantly the corporate staff agreed. At the formal presentation, the room was silent as the rendering and color boards were positioned. The CEO exclaimed, �I love it! We should use blue in more of our designs.� Someone in the room said, �But, sir, I thought you didn�t like blue.� �Well,� the CEO responded, �no one has asked me in fifteen years!� Progress!